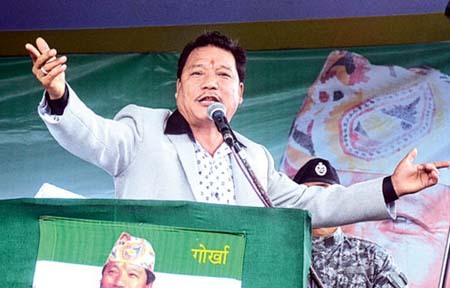 Bimal Gurung today announced a 12-hour bandh in the Darjeeling hills on September 28 to protest the alleged false claim by Mamata Banerjee on the quantum of funds provided by the state to the GTA and threatened to extend it if police intervened to foil the shutdown. The Gorkha Janmukti Morcha said the dawn-to-dusk bandh was being called also to protest the state government's failure to settle the annual bonus rate for workers in the tea gardens of the hills. Gurung had said on Friday that if the chief minister failed to give the details of the Rs 4,000 crore that she had claimed to have sent to the GTA by September 27, the Morcha would enforce a bandh the next day. On the same day, Mamata announced in Kalimpong that she wouldn't allow a bandh in the hills. While Mamata said on Thursday that the state had released Rs 4,000 crore to the GTA, the Morcha claimed that the figure was wrong and not more that Rs 3,000 crore had been received by the hill body. Addressing a meeting of the Nari Morcha's Kalimpong branch at Delo near here today, Gurung said: "I have information that police are calling up businessmen and asking them to open shops. The police should not be acting at the behest of the Trinamul Congress...If the police forcibly open shops, I will continue the bandh... The 12-hour bandh will be enforced strictly on September 28, not even a cycle or a bike will be allowed to move." Today also, the Morcha president, who is the GTA chief executive, said Mamata's claim of Rs 4,000 crore being sent to the hill body was false. "We have checked in the GTA, and the state government has only given Rs 238 crore in the past four years. In the same period, the GTA has received about Rs 2,000 crore towards the salary of its staff. Funds have also come from the Centre. Only about a fortnight back, the state government carried out a special audit in the GTA and found no discrepancy," he said. In Darjeeling, the Morcha issued a press release stating that the bandh had also been called to protest the failure to settle the annual bonus rate of tea garden workers in the hills. Workers in the hill tea gardens demand that the bonus be fixed at 20 per cent. Gurung made no mention of the bonus issue in his nearly hour-long speech at Delo where over 1,000 women braved incessant rain to hear him. Seeing people drenched in the rain, Gurung asked for umbrellas and distributed the same to his supporters. Gurung also said he would be going to Delhi after October 2 to meet home minister Rajnath Singh. "There will be only three points on the agenda: formation of a committee on Gorkhaland, granting of Scheduled Tribe status to 11 Gorkha communities and establishment of a central university in the hills," he said. The Morcha chief indicated that his party would decide on the next phase of agitation for Gorkhaland depending on the outcome of his Delhi visit. "After my visit to Delhi, I will announce from the Mela Ground (in Kalimpong) the next course of action in front of more than three lakh people," he said.